Gen. Prawit, who oversees National Security, issued the order during a meeting of the military, police and Interior Ministry security agencies yesterday, according to Defence Ministry spokesman Kongcheep Tantra-Wanit. Gen. Prawit told General Surachate Hakparn to step up efforts to keep foreign tourists safe and to crack down on transnational criminals who enter the Kingdom posing as tourists. The Immigration Bureau was ordered to strictly enforce the law, weed out foreigners without visas and overstaying their visas and deport them within one month. It was told to check whether foreigners doing business here were working in professions that were legally reserved for Thais. Pol Maj-General Surachate Hakparn was recently promoted to acting Immigration Bureau chief after spearheading a series of raids and spot checks that have so far found more than 1,000 foreigners overstaying their visas. Surachate has strong connections with Prawit whose popularity has been declining after the luxury-watch scandal. The police commander had recently made a name for himself with his crackdowns on crimes related to foreigners as deputy commander of Tourist Police. Thailand welcomes more than 30 million visitors annually for tourism. The country is also home to millions of documented and undocumented migrant workers from all over the world. Illegal entry and overstay are not unusual for the country. Canadians were the biggest group at 9,872 – followed by 9,583 Dutch, 9,566 Bangladeshis and 9,483 Italians. During the same period, more than 10 million foreign tourists entered the Kingdom, the bureau said. 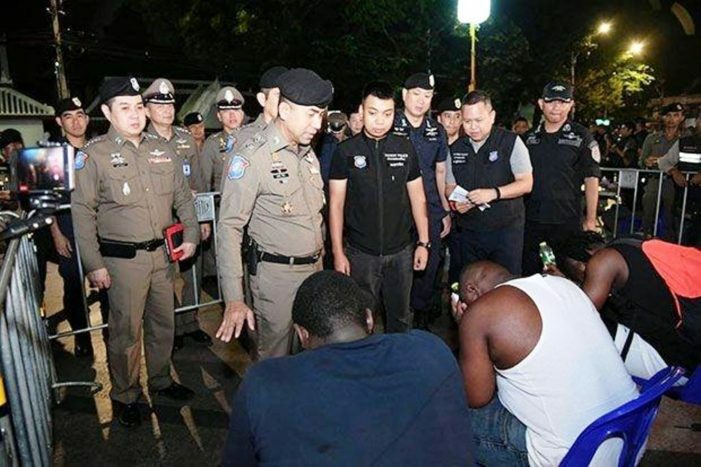 Following Prawit’s order, Surachate led police yesterday in collaring 22 citizens of African nations and a Myanmar man on Bangkok’s Sukhumvit Soi 3, some of who were just walking on the street. General Surachate called a press conference yesterday to discuss measures in helping victims of call-centre gangs and 412 romance scams. Police operations over the past years to suppress foreign criminals has managed to return Bt27 million to 133 victims of such crimes, he said. Expat forums and reaction on social media was mixed, however, it was strongly suggested by many long time legal expats to keep a copy of your passport and entry/exit stamp on your person. It is legal to Thailand to spot check the status of ones passport.